In common with most other compressed bronze bottles, this one is made in two separate halves joined vertically at the narrow sides. The process is all but invisible on the outside, because the substantial gilding has covered both the more obvious traces of the join and any solder used, but it is obvious inside. At first glance, it looks as if the work might have been chased with cold steel, the artist carving away the excess metal and detailing the surface by hand, but there are other bottles from the same set of moulds. One, in the Drummond Collection in the American Museum of Natural History, is so similar that the two can only have been made from the same mould. We have photographs of only one side of the Drummond bottle, but another example, of which we have photos of both sides, is in the Carl Barron Collection. Another from the same mould, also with the original stopper, is in J.W.A. International and Christopher Randall 1995, no. 22. One showing only the side with the vessels was published in Galerie Comes 1985, lot 32. The Drummond bottle is in a dreadful state, its gilding gone, the bronze dull and covered in verdigris. The Barron bottle has its gold worn off but is otherwise in good condition. A comparison of the different versions makes clear that the details on the bodies of the bird and deer and the lines to delineate foliage were added by hand as a second stage, whereas the main design, the positioning of the various elements, and the deeper angled strokes are identical, suggesting that they existed in the mould. There are several reasons for giving this an Imperial attribution. 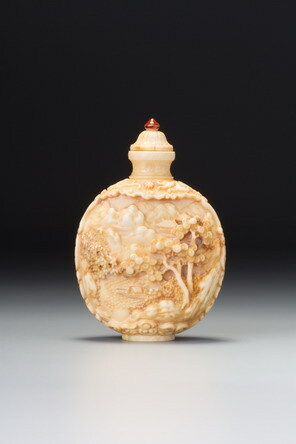 There is a similar bottle decorated with five-clawed Imperial dragons and marked, according to the catalogue, as made by order of the Qianlong emperor (presumably Qianlong yuzhi, although the Chinese is not given; Christie’s, London, 12 June 1972, lot 168). The metal equivalent of the moulded porcelain dragon-and-fenghuang bottles of the mid-Qing (see Treasury 6, nos. 1203–1207, for instance), it was in the Ko Collection; the records for which tell us that it was purchased in Beijing in 1923. Moreover, bottles like the present one seem to reflect, or be reflected in, a series of Imperial moulded porcelain bottles with similar scenes of auspicious objects in this sort of busy composition, bottles that can be dated to the mid-Qing period. It is possible that the bronze bottles came first. The shape of these bronze bottles also reflects these lacquer bottles, which we believe were made in quantity for the court. Another feature is that they were obviously made as a series, which is typical of Imperial production; and finally, the original stopper is a typically courtly shape and design. 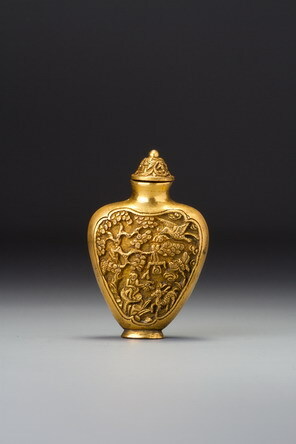 A number of other metal bottles strongly suggest Imperial connections and were probably made at or for the court, or in Imperial style to be presented to the emperor. One spectacular example, for instance, was offered by Sotheby’s, New York, 27 June 1986, lot 89 (also illustrated in JICSBS, Autumn 1986, p. 26, fig. 5). Another likely Imperial bottle from the Qianlong reign is in JICSBS, Spring 1998, p. 1.